With the development of digital technology, "moving manga" appeared. "If the manga moves, it is no longer manga, it is anime." I think that there are opinions as above. Does it make sense to make moving manga? This article summarizes about ideal moving manga. Is it worth the moving manga? There are several kinds of "moving manga"
Among them, I think that "Motion comic" by "Shift One" is the closest to the ideal. Music and sound effects are attached, and voices are also attached. frames are automatically switched without clicking. Will it be anime if manga moves? Even for moving manga, it is better to use the character of manga. Then, it is not anime but manga. This article summarizes what kind of "moving manga" that made use of manga-unique expressions. In other words, it is the ideal "moving manga". What is the ideal "moving manga"
Compared with "ULTRAMAN" of "Motion comic", I will summarize ideal moving manga. When switching frames automatically, it is difficult to decide time to display balloons and frames. Some people are quick to read and others are late to read. If the display time is long, those who read fast are irritated. Motion comics have a voice actor's speak, so people who are quick to read are not irritated. However, the voice actor is speaking after all the text have been displayed. This is not good. Generally speaking, reading speed is faster than speaking speed. So, most readers are irritated. It's better to display the text at the same speed as the voice actor speaks. If so, a voice actor may not be necessary for moving manga. Manga expresses still pictures as if they are moving. Express the "motion" by using the speed line and the pose of the character. "Motion" of manga is sometimes superior to motion of animation. So, in most cases, animation effects are unnecessary for "moving manga". In "moving manga", it is better to use "motion" of manga. Textual expression is characteristic of manga. For example, "KAKIMOJI" is an expression of onomatopoeia as text. For example, "テテッ" in the following frame is so. "KAKIMOJI" expresses various things besides sound. "テテッ" also expresses that the boy is running cheerfully. So even if SE is attached, it is better to use "KAKIMOJI" as well. "KAKIMOJI like speech line" is a speech line with low importance. In some cases it explains the meaning of the character's facial expression. The above "いってーなー" expresses the expressions and feelings of the character. This is not a speech line. Therefore, there is no need to attach performance of a voice actor to "KAKIMOJI like speech line"
In manga, it is better to emphasize text than sound. However, it is a good thing to put music on manga. The absence of music may be the biggest weakness of manga. 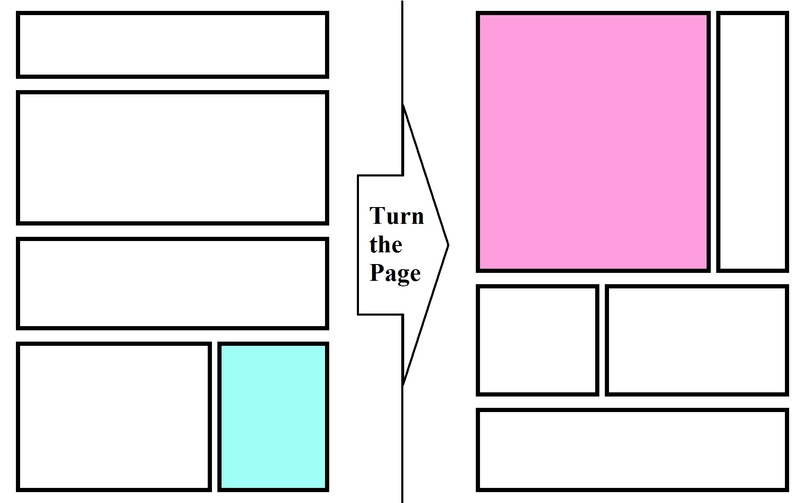 In the case of manga that the reader clicks and switches frames, it is hard to add music. However, in the case of manga in which frames are automatically switched like "motion comic", it is easy to add music. In the case of moving manga, it will be released from that rule. In other words, free layout is possible. In other words, it is necessary to make a layout like a movie rather than a manga-like layout. The ideal "moving manga" is as follows. In the above form, it is not anime but manga.